Elliot’s new sweater is finished, fits, and is being enjoyed by the recipient. He is over the hat. Sooooo cute. Thank you for sharing! Adorable. He has such a sweet smile. What a fun surprise post on a Sunday morning! SO!! CUTE!! Quite the handsome little man in his sweater and hat! Such a great sweater model — that smile! Nice work, and I suspect if it was cold, the hat would be welcomed even without the ties. I had to laugh at the hat scene- none of my grandkids would even leave the hat on long enough for a picture!! Elliot (and you)–made my day! Thank you! Nothing sensible to say about the knitting, I’m afraid – too busy going Awwwwww, all the way from the UK. Given I’ve never met you, going on your photos I really think he looks a lot like you! That baby needs socks to match the hat and sweater. Yes! Those goodies are going to get cold. Is there enough yarn left to match the sweater and hat? “goodies” should have been “tootsies” Darn autocorrect. That’s what I thought! Cold toes! Me too, about the popsicle toes. 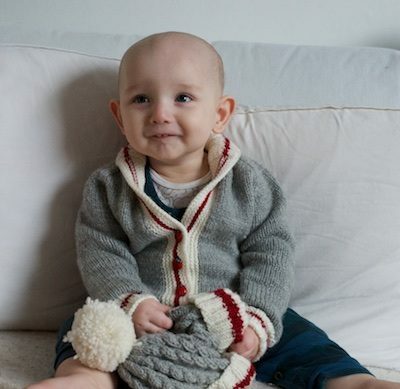 I’m glad you had enough yarn to finish the second sweater for Elliot. He looks so handsome! I love matching sets – especially on babies. Whatever happened to the first/too small sweater, though? Has it gone to another baby? Or is it languishing in a closet somewhere, reflecting on its sins? Love the photos and narrative; what a balm to all our souls! He is so darn cute! So photogenic and happy! Love it! The sweater and hat are darn cute too! Oh, his sweet little bald head! I am really very quite much great deal a lot concerned about the buttons on that sweater. Of, course, Presbytera, it isn’t as though we haven’t been through this before, is it? Buttons can be sewn on with one continuous thread. Instead of each button being sewn on with two separate ends that have to be woven in, just work the thread from the first button on the backside up to the next button. Virtually impossible for the buttons to come off and cause a choking hazard. THAT is brilliant – even for clothing not intended for babies. Dude, you gots to wear the hat! You don’t have enough hair to keep your head warm yet! Knit some ear flaps in with ties at the ends. If your weather is anything like ours in Vermont, spring is a euphemism for winter isn’t nearly over yet and you need snow boots, mittens and very brightly colored eggs for hunting outside on Easter morning. Maybe an adorabule little fair isle chullo hat, with ear flaps and ties? It (and he) looks great! Spent a rather exhausting half hour yesterday trying to take some photos of my rambunctious little 11 month old, and the whole time I kept thinking of the beautiful Elliot pictures you’ve posted with a mixture of envy and awe… of course he’s adorable, but wow getting a decently lit picture where he’s looking in a reasonable direction, you don’t miss the adorable expression, and nobody’s exiting the frame in a giggly blur is harder than it looks! I don’t know who’s been taking the photos you’ve posted, but whichever of you it is has my admiration (and I want to know if there are tips!). I’m also reflecting deeply on the fact that nowhere in my house seems to offer both good natural light and an attractive, uncluttered background (the best windows all seem to be adjacent to unpicturesque passageways). Not something I ever worried about before! I know, right? I’m with you on all counts! In my house you have to shove the mess aside before you can get a decent picture– by which point the kids and cats have already left the room! What a dear little boy in his special sweater and hat. 🙂 Gotta love those cheeks and that big grin! Uh, oh. He’s gearing up for the “terrible twos”. If Mom and Gramma want him to wear the hat, he’ll take it off. If Mom wants him to let her have the hat, he’ll keep it away from her. If Mom and Dad tell him not to touch the (whatever), he’ll wait until they are across the room and are looking in his direction, then he’ll touch it. I love the buttons and that adorable smiling face! Beautiful hat & sweater on a darling boy. Love the buttons! Thanks for sharing. He probably got a laugh the first time he pulled it off and we all know where it goes from there. Maybe a couple of icord ties in red, sewn on inside the turnup. My gosh…he is adorable and his face reflects so much love. Given and received. Love the sweater and hat too. I’m mentally going through all contacts to see who might be needing a set like this. Thanks for the pictures. He is so joyful, makes me smile. So cute – those photos really made my morning, thanks so much!! I never comment, but the cuteness factor is just unbearable! Your grandson is adorable, you can tell he is loved by all his family. Love the hat & sweater! Oh my this is darling! He is such a darling! Thank you for sharing him! Great sweater, wonderful model, prize winning smile! Win, win. I hope he always feels this much joy. Oh my goodness he is delightful!! It looks like the hat is a game he’s playing with you! What a sweet outfit for your little man! How adorable. I am going to have to knit a matching set for my little lumberjack great nephew! It’s never too late to add i-cords! I’ve taken to starting all baby and toddler hats (no matter the pattern) with the Garter Ear Flap hat from Purl Soho, to give sufficient ear coverage and a handy place for ties. Is this kid ever NOT smiling? He’s so happy! Great smile!!! He melted my heart! What a treasure !!! So precious! 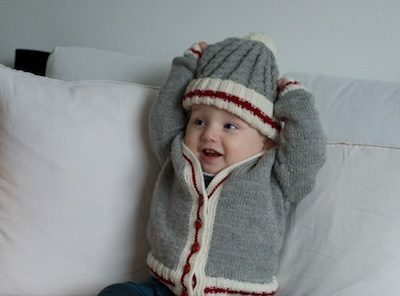 However the fabulous of the sweater and hat are far outshown by the adorable that is Elliot! Great pictures! He looks so much like his mom already! What a sweetheart. Love the button photo! Thank you! Aw, what a sweet little set. He’s ADORABLE! When did Elliot get teeth?! Time is flying so fast with this one! PERFECT! The sweater and hat aren’t so bad either. Rough weekend and not feeling well. I don’t know what vibes in the universe told me to log in and read the blog today, but I am SO glad I listed! Those little Elliot smiles have made me feel so much better. 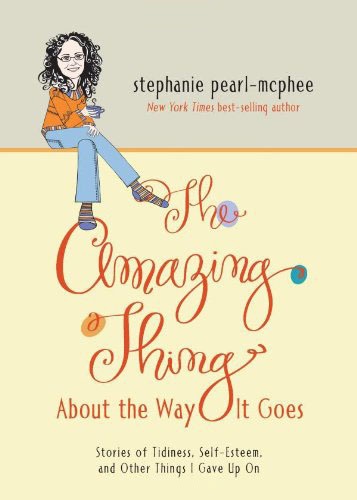 TY Stephanie, for sharing so much with us! Thanks so much for that Steph! Man, that is a seriously cute kid. He has the most expressive face. 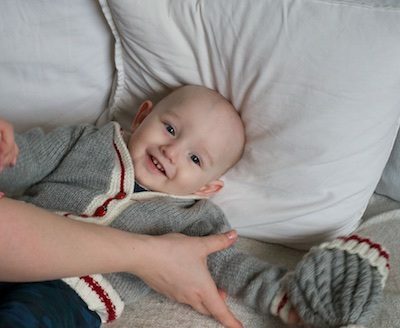 Simply adorable, grandson and knitting both. Melting. That smile! He’s adorable, and that outfit celebrates! Silly Grammy – everyone knows you don’t wear hats indoors! He looks so pleased with himself for removing it! Cute sweater, made completely adorable with those buttons. This made me laugh out loud…he’s so proud of himself for taking off the hat and Mum (or Gramma) is not getting it back!! Adorable! Thanks for the sweet pictures. Enjoy that little tyke. The joy he gets from taking the hat off is worth it alone. He’s such a cute little knit wear model! That hat doesn’t even need to be worn! It is totally adorable in his little hands!! Perfect hat and cardi! He is just ridiculously adorable! Adorable! Also, I get that he looks like your side of the family, but he also looks a lot like his dad. A beautiful reknit! And such an incredible cutie–I want to pinch those cheeks. But where are the matching booties? Surely you have a bit of left-over stash. Oh my! He is SO adorable and so are his sweater and hat. Love how proud he looks that he took his hat off! Thanks for sharing your precious little guy with those of us who wish for grandbabies and aren’t likely to have any. Elliot is absolutely adorable!! That ornery grin just melts my heart. I have a definite soft spot for ornery little boys. You will so enjoy watching him grow. My youngest grandsons are just turning 6. If only he were a happy baby, lol. How happy for you to have such a terrific grandson to knit for. The sweater is perfect, I love the buttons, too! oh those eyes and that smile!! heartbreaker…. Isn’t it amazing how quickly a baby goes from adorable little blob to *a person*! With opinions and actions to suit! I never get tired of that! The post-hat-removal photo wins best pic of the year! What a cutie! He is gorgeous. So are the handknits! Ohmyword. Too adorable in that ensemble. That face! Every knitter needs to identify a friend with a child a few months younger who would appreciate outgrown or too small knitwear. About the hat thing, maybe his bald head makes hats itchy. He is awfully adorable. As soon as they can pull off their own hat, its time for a balaclava! More knitting! Sorry but I hardly noticed the sweater and hat. Got sidetracked by Elliot’s adorable expressions, what a cutie! Of course the sweater and hat are great also.